London is the city of such diversity and complexity that no wonder it sees around 17 million tourists annualy! Whether one comes to discover the humour and the famous British phlegm or get closer to the scandalous royal family, take a tour in a double-decker bus, check out the notorious English eccentricity, go shopping in Regent Street, drink tea at 5 PM, visit some of the top-ranked museums in the world and iconic monuments of London… Well, there is something to do for everyone! And in case all jokes about inedible British food made you biaised against it well before your arrival, don’t worry: you’ll find most of the world’s cuisines on London’s streets. Which period to choose and which to avoid? The calmest month in London is February. The crowds will be not-existent, and even if you won’t be alone in the museum hall, you’ll be able to enjoy the quiet of the low season along with cheaper rates. There can be a half-term holiday week for schoolchildren though, and it’s better to avoid - as many families come to London, and it becomes very crowded in museums. The weather rather unpleasant overall. Winter is generally the period with the lowest number of visitors (except for the Christmas period): come at the beginning or mid-December for the Christmas lights and markets, or choose January for shopping sales. The best period of the year is probably the second half of September: it’s warm and usually dry, with a relatively small number of tourists in the city and all children in school. October is mostly similar, though there’s a half-term holidays week you’d prefer to avoid: top attractions get overcrowded. Another good alternative is to enjoy the city when it gets awake after the winter and the crowds are not in place yet: March is a good compromise between the weather and the crowds. Saint Patrick’s day will be busy but - at the same time - a great opportunity to discover London’s pubs and bars. Summer is the peak season with the largest number of tourists. Try to avoid at least travelling to London in August, as it’s the busiest month. June can be bearable being the calmest of the summer months, though don’t look for solitude on the day of the Queen’s official birthday celebration. April and May are very popular as well - they follow the summer months in terms of visitors number. April is to be preferred if you’re into sports events: the London Marathon and the Oxford and Cambridge Boat race usually take place this month, while May is mostly known for floral-themed events and is the start of the outdoor festivals’ season. First of all, try to avoid visiting London during the UK school holidays: all big museums are considerably more crowded. If you have the opportunity to go on a weekday, do it: it’s always calmer. The weather has a big impact on crowds, in case of sudden rain you can expect an extra flow of visitors, especially in museums with free admission. On the contrary, sunny days are to prefer to avoid queues. London’s British Museum is the most popular visitor attraction in the UK, with some 6,7 mln visitors in 2014. Although there is no real waiting line issue (the admission is free) and you won’t need to queue to buy a ticket, it’s very popular and there tend to be big crowds inside, especially in front of the main exhibits. Some exhibitions at the British Museum tend to attract tons of visitors, check the current and upcoming ones in order to avoid visiting the museum on their opening and closing weeks. Peak hours are during lunchtime (from 11:00 to 15:00) and throughout weekends. In order to visit the museum at its calmest, come on a weekday morning or on Friday evening (during extended opening hours). At the same time some galleries tend to be almost empty even during peak hours, like the Japanese or the Prints and Drawings Galleries. Keep this in mind to prepare your visit: if you arrive at the opening time - see the big sights first, then explore the galleries that interest you more than others and head to the lesser-known ones when the British Museum becomes overcrowded. If you arrive in the afternoon - leave the big sights for the end of your visit when there will be less people. Saturdays tend to be much busier than Sundays, prefer Sunday for the visit if you’re coming for a weekend. Tuesday is the best day to visit, with a smaller number of visitors in general during the week. Monday and Friday are also good options to consider (especially Friday night). You can spread your visit over a series of mornings, or leave the Museum when crowds start to arrive and come back later in the day. That’s the second most visited place in London for the art lovers. There is little queueing thanks to a lack of admission fee. However, It can get very busy inside, as the gallery receives more than 6 million visitors every year. 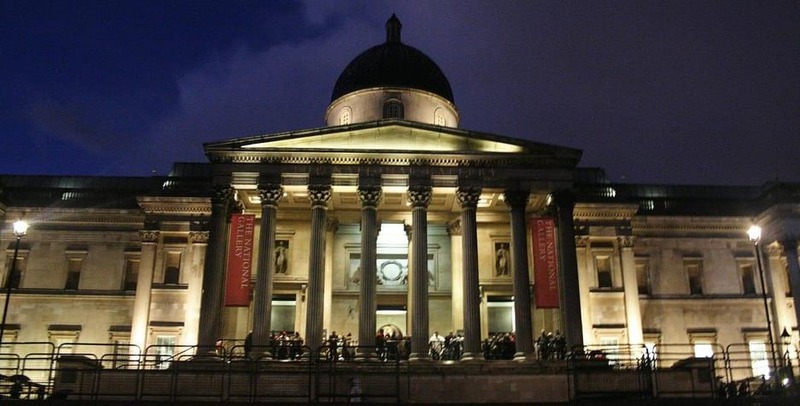 The Gallery has three entrances facing Trafalgar Square: the Portico Entrance in the center (under the Dome), the Getty Entrance (to the right) and the Sainsbury Entrance (in the smaller building to the left of the main entrance). The oldest, mostly religious paintings in the collection (Early Renaissance) are in the Sainsbury wing, along with temporary exhibitions. Therefore, to start the visit in chronological order, it is best to take the Sainsbury entrance. Sheltering the highlights of the National Gallery’s collection, some rooms tend to be more crowded than others. Most of all rooms 43 (Manet, Monet and the Impressionists’ paintings), 45 (Van Gogh and Cézanne’s paintings) and 46 (Degas and Art around 1900). Try to see these more popular rooms when there are less visitors, at the beginning of your visit, if you come in the morning, or at the end of your visit, if you come in the afternoon. The quietest time overall is usually first thing in the morning on a weekday: come at the opening and head to the most popular paintings if you want to get up close to see the works of art before crowds arrive. Fridays late opening is also a good option: the Gallery remains open until 21:00. The busiest time is from 15:00 to 18:00. For popular exhibitions, a timed entrance ticket booking may be necessary, plan your visit beforehand, sometimes you need to book a week in advance! Big events and festivities taking place in London that can attract an important number of visitors to the city. Only those who do a bit of researching before the visit know that on Wednesday Westminster Abbey closes later, at 7 pm (with the last admittance at 6 pm). The best part is that only individual visitors are allowed, no groups or tours inside at these hours, so this time is really the least crowded! Come by 5pm and take your time to explore one of London’s top attractions. Arrive at the opening time or about 20 minutes before if visiting in July or August: it’s when the Abbey is least crowded. During popular summer months arriving this early just to see quite a long line snaking out already may be discouraging, but don’t worry: a couple of hours later it will be three times longer! Tourist groups start arriving about one hour after the opening time, and the Abbey becomes overcrowded very fast. Your early arrival will guarantee a calm experience. Lunchtime is usually the busiest time of the day (just after the Changing of the Guard at Buckingham Palace). Late afternoons are calmer, but during busy periods it may be necessary to arrive well in advance of the last admittance hour (there can be a long queue and you just won’t be in time to enter). Try to visit the Abbey as worshipper. During church services, it is free for the public to enter the Abbey for worship. You won’t have access to tombs and monuments, but sitting in the nave during the service will give you a strong taste of the history this place holds. Worship takes place every day in the Abbey, usually four services daily at 7.30am, 8am, 12.30pm, 5pm. On Sundays there are six services at 8am, 10am, 11.15am, 3pm, 5.45pm, 6.30pm. Avoid religious holidays (on major holidays, like Easter, Christmas, etc., it’s not only crowded but also closed to tourists), school and public holidays. Out of the weekdays Monday is the one to avoid and try to schedule your visit for a Wednesday. London Pass gives you free access to Westminster Abbey, but it doesn’t provide a fast lane entry: you’ll have to stand in the queue like everybody else! Join a guided tour of the Abbey, departing throughout the day from the information desk. You’ll pay £5.00 additional charge at the entrance to be part of this 90-minute tour. Since they are limited to 20 people, you need to contact the Abbeys Information Desk to book your place. If you feel like exploring the place on your own, pick up an audio guide at the entrance, which is free with admission. The Galleries are quietest at the opening time, try to plan your visit for the morning. It then starts to be crowded at lunch time. Friday, Saturday & Sunday are the busiest days. Wednesday is the quietest day while Saturday is the busiest. The best way to avoid crowds is to visit the Tower of London first thing in the morning. Once the site is open, head to the Crown Jewels first thing. After you’ve seen them, line up for Beefeater’s tour. The crowds are huge during the school holidays. Try to avoid weekends and Fridays, prefer coming mid-week when there are no weekend tourists in the city. Late afternoon is another good option for the low season if you can’t visit Tower in the morning. Saturday is the busiest day of the week, definitely to avoid! The clue to a crowd-free visit is to arrive as early as you can: it opens for services at 7.30am or 8am, and then officially to visitors at 8.30am (galleries start at 9.30am). As it opens earlier than most other places on the list, we advise to start your sightseeing day from St. Paul’s when the Cathedral is at its calmest. The State Rooms of the Buckingham Palace can only be visited July 22nd through October 1st in 2017. The best way to guarantee yourself the visit is to book the ticket online well beforehand: they are often sold out months in advance! London Pass is available for 1, 2, 3, 6 or 10 days, it may include or not the public transport. A one-day pass for an adult costs £62.00 (£75.00 with transport), for a child - £42.00 (£48.00 with transport). Check well the conditions before purchasing and try to plan your trip in order to foresee if London Pass would be able to save you money. For more information, click here. We’re waiting for your postcards and have a great trip!